According to contemporary historical records, Kőbánya was annexed to the city of Pest by King IV. Béla in 1244, under the name of 'Kőér'. The right of city of Pest to Kőbánya was affirmed by Leopold I in 1703. As research suggests, the famous Rákos field parliaments were held partly in the area of present-day Kőbánya. The stone mining past of this settlement is kept alive by a huge, partly undiscovered cellar system. Vine-growing, brewing and water-milling activities were significant in the are of present-day Kőbánya. Food processing, brewing and pharmaceutical industries are still of considerable importance. Forming a new city centre and the complete modernisation of Örs vezér square, Éles corner and its neighbourhood are under way. 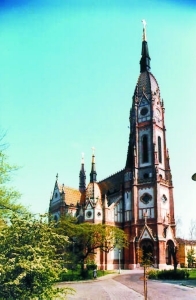 A unique sight in the city centre is the St. László church, designed by Ödön Lechner and built in 1899 as well as sculpture composition by Tibor Szervátiusz on the other side of the St. László square, inaugurated in the Millecentenary year.